Fill out our service form, and we will contact you within 48 hours to schedule a service. Door County's Largest Selection of Mulch. We offer a variety of natural materials to beautifully landscape your environment including the largest selection of mulch in Door County, more than seven types. Either pick it up or have us complete your makeover, we're up for any job. 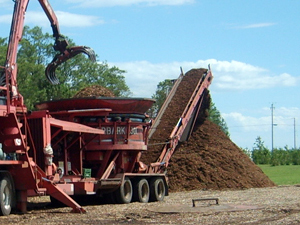 We are proud to offer seven types of mulch for all of your landscaping needs, and we regrind our everyday woodchips to make for a much nicer product. See more photos of products in the Photo Gallery. This is a short list of the products we provide. do not see it mentioned, please give us a call. Large quantity discount rates are available. Trees and Shrubs - A wide variety of nursery stock. Firewood - All firewood is cut locally and complies with Door County guidelines. Spindling and rounding of posts for custom handrails and fencing, or for other artistic projects such as building furniture or swings. * There is a small fee ($20-$45) for delivering firewood and mulch depending on your location. Serving Door County, Kewaunee County & Northeastern Wisconsin. Located just minutes outside of Jacksonport on the corner of County V and Elm Drive. Site design and marketing by 1designsource.com.